Having released her debut album just last year, British singer-songwriter Rita Ora is going from strength to strength. She recently completed the sold out twelve-date UK leg of her Radioactive Tour to much acclaim. An essential part of the audio arsenal employed by front of house engineer Bronski for her live performance is a selection of Sennheiser microphones. Bronski, who started working with Rita in February last year, has opted to use Sennheiser microphones for both Rita and her band because, he says, there is simply no better sounding, more reliable product on the market. "Sennheiser wireless products are second to none," he says. "It's always the easiest choice to make, and it helps that Rita's voice sounds great on an SKM 2000 with an e 935 capsule. Her vocal always sits on top of the mix, and the e 935 enables me to find delicacies in her strong delivery. "The same goes for the e 904s and e 604s we have dotted around on various toms and snares (Rita also plays a tom). The microphones are consistently great sounding and forgiving on tiring drumheads." Bronski also reports that they have had no RF issues, with the microphones or the Sennheiser G3 IEM systems that are in use, an important factor for a busy touring schedule. "Mark Saunders' [Sennheiser UK’s artist relations] assistance on this project is outstanding," he concludes. "He’s always available if I need assistance and keen to help out. And the advise on an international level has been extremely helpful. Rita launched worldwide from the start, so having alliances and help in these new territories has been amazing." 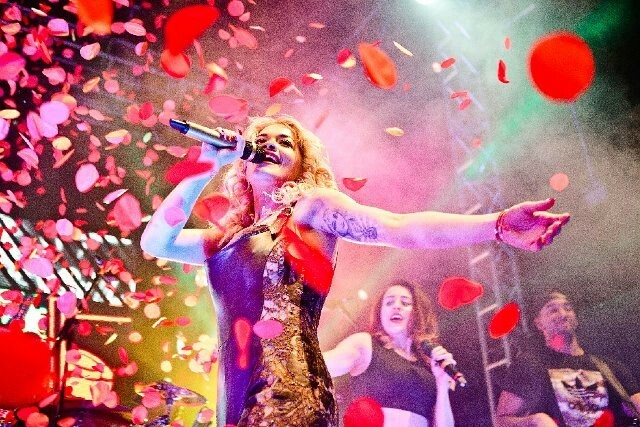 Rita’s touring commitments have continued with festival slots and headline shows in Australia and Japan.